Spots for our Monday 6:30pm Adult Beginner class are on a first-come, first-served basis. Make sure to register as soon as possible since we have a limited number of spaces, and the class will definitely fill up! The 7-week session starts Monday, October 29 and ends on December 10, 2018. In addition, there is a makeup class on Monday, December 17. The cost for this session is $98. If you have any questions text us at 512 942 7892. Flamenco is a unique musical form from Andalucia, the southern region of Spain. The roots of flamenco go back hundreds of year when Spanish, Muslim, Jewish and Gypsy (Roma) cultures all mixed, resulting in a musical form that was preserved and developed in later centuries. 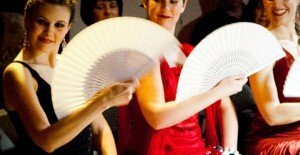 Although flamenco is danced by both men and women, female dancers called “bailaoras” have dominated in the popular imagination, since flamenco provides a unique opportunity for women to express strength, vulnerability, sensuality and an almost infinite range of emotions. Our Adult Beginner Flamenco session consists of 8 1-hour classes (once per week), Mondays from 6:30-7:30pm or Sunday 11-12am. The session fee is $108. 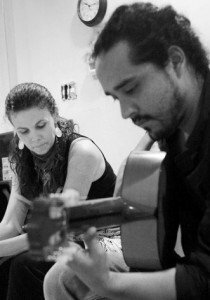 Students learn all the basics of flamenco, including braceo and floreo (arm and hand movements), taconeo (percussive footwork), rhythm and musicality. We will learn a short choreography in order to understand musical structure. All classes take place at Flamencura Music and Dance Studio, which opened its doors in May, 2010 as Austin’s first dance studio dedicated to Flamenco. Our studio is located in North Central Austin at 7113 Burnet Rd., Suite 111. Flamencura has a lovely 750 square foot main studio, equipped with mirrors and sprung plywood floors specially designed for flamenco dancing. Beginner flamenco dance classes are taught by founder Olivia Chacon. She has danced flamenco for nineteen years, including more than four years of study in Spain with the world’s greatest flamenco stars. She is an experienced performer, having danced in theaters and flamenco tablaos throughout Texas, Spain, Mexico, Germany, and Cyprus. In 2013 Olivia received an Austin Critic’s Table award for Best Dancer for A’lante Flamenco Dance Ensemble’s “The Red Shoes: A Flamenco Fairytale”. Olivia is also a seasoned instructor, and enjoys introducing new students of all ages to the joys of flamenco through her original choreographies. This Fall we will be having a Monday 6:30pm and Sunday 11am beginner class. This 8-week class offers a complete introduction to flamenco, including basic posture, hand and arm movements, footwork, rhythms, and a short choreography. One make-up class will be offered at the end of the session. Register below!